Situated at 3162 Stevely Ave. in Long Beach is a fresh-on-the-market, expanded Cliff May rancho, mid-mod masterpiece originally built in 1954. The more-saturated-robin blue home was originally 1,245 sq. ft. with its detached garage and was recently expanded to 1,810 sq. ft. to create a larger living room, entry way, and interior atrium. Classic are its original May doors—including the master bedroom sliding doors—and windows. Other features are the interior atrium with a water fountain, open kitchen with two islands, wood-burning fireplace, clerestory windows, and expanded bathroom with an air bath tub. 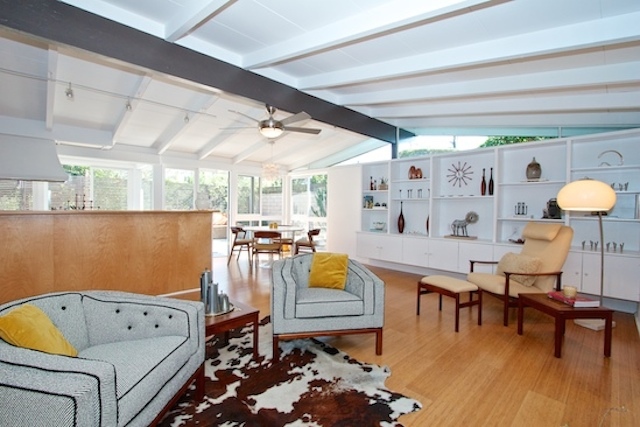 Long Beach is home to the largest and most well-kept neighborhoods of Cliff May’s famous ranch houses in the area—particularly where this three-bedroom gem is located (and another was sold on nearby Karen Ave.). Cliff May is a California architect of epic proportions—after all, he is the father of the ranch house, a mid-century pillar of Modernist architecture characterized by its long, close-to-the-ground profile paired with minimalist exterior and interior decoration. This three-bedroom, two-bath home is selling for $715K.